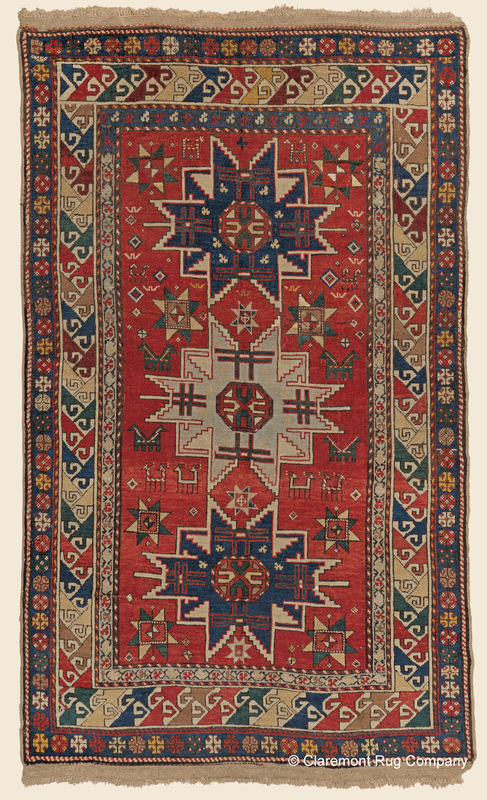 Search Our Inventory / All Rugs / 3&apos; 9" x 6&apos; 0"
3&apos; 9" x 6&apos; 0"
This unforgettable rug displays an ambitious effort to place the mesmerizing Lesghi Star, the signature motif of a tribe that resided hundreds of miles to the east, within the Kazak region�s traditional aesthetic. Here, on an expansive field of jasper red, three sparsely decorated star shapes float amid a cosmos of sprinkled geometric symbols and comic animal forms, capturing the beloved Kazak whimsy. The exquisite choice of ethereal celadon for the center stellar ornament and of eight additional smaller stars in the field are inspired, ingenious additions. This tour-de-force tribal rug is evocatively finished with the interlocking dragon motif in the main border that further expresses its enigmatic, archetypal artistic origins.